iit! Intelligence, innovation, tradition – these are the principles that permeate Ludwig Oechslin’s work. Three key words that drive him to new flights of conceptual fancy. Solving complex tasks with ingeniously simple ideas. ochs und junior is the vehicle for his watches, his technology, his designs, his insights – and also for his art. There are thoughts just waiting to be realized, energy waiting to be transformed into sculptural embodiment. All it needs is people to have these thoughts, to wield this energy. Like his watches, Ludwig has friends alongside whom he works to implement his large sculptural concepts. 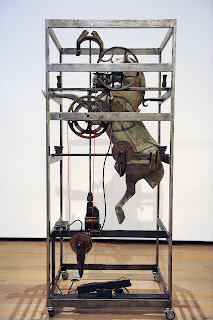 The Tinguely Museum in Basel devotes exhibitions to companions of the great Swiss metal sculptor Jean Tinguely. 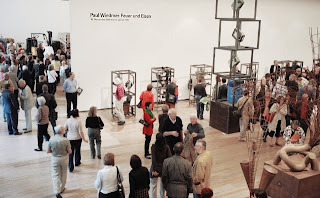 From 16 September 2009 to 24 January 2010 the spotlight turns on Paul Wiedmer and his spectacular opus Feuer und Eisen (Fire and Iron). 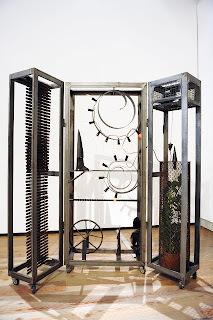 Paul Wiedmer spent 1998 and 1999 bringing Ludwig’s horological sketches and ideas to life, creating as he did so nine powerful, didactic sculptures – the ZeitZeichen (Signs of Time). These pieces embody in chronological order the measurement and flow of time. 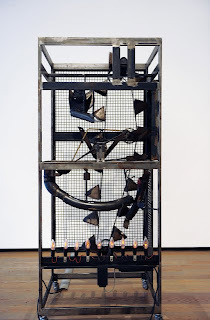 The subject of Paul Wiedmer’s ZeitZeichen (Signs of Time) – a group of eight plus one iron sculptures or installations – occupies a special place in the artist’s oeuvre. The works are the product of a joint conception and cooperation between Wiedmer and Ludwig Oechslin, a watchmaker and historian of applied sciences, and refer to the most significant steps in the development of mechanical timepieces over the past eight centuries. 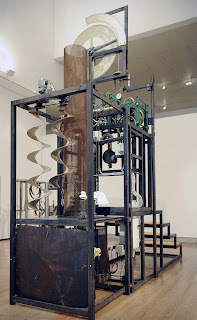 The subject of these so-called didactic models is the crucial element in the development of both a technology-based culture as well as of an art form that profoundly influenced and fundamentally changed the life not only of individuals, but of industrialized societies as a whole: the mechanical clock, the regular tick-tock of a complex inner life, the physical laws of whose mechanism and operating principles may serve as a metaphor for the cosmos and as the embodiment of modern civilization. 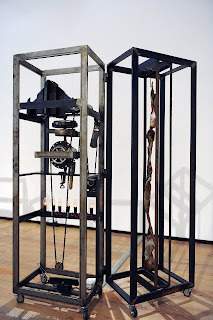 The eight iron models were created in 1998 and 1999 and shown as SkulptUhren (literally “Sculpt-Clocks”) for the first time in 1999. For his subject Wiedmer chose four physical factors or principles and their effects: energy, store and control of power, and the elimination of disturbance variables. Research into these principles and the application of the results to a mechanical wheelwork have been the driving force behind the development of this genuinely European invention since the 13th century. Wiedmer gives each of these four factors concrete artistic expression in the form of two installations. 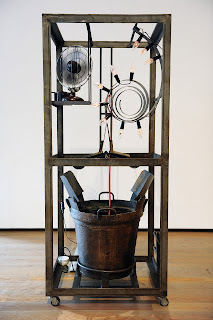 These eight “steps” are complemented by a ninth installation with orbiting pendulum, wheel, spiral lights and plant that expresses our two different dialectical interpretations of the movements or constructions of time: the reversible, recurring, cyclical time of the cosmos and the irreversible, non-recurring, linear time of living organisms in the course of history. 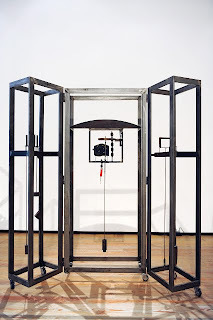 In short, the installation Zyklische Zeit – Lineare Zeit (Cyclical Time – Linear Time) is a condensed representation of the essence of time and the concept of time as understood in cosmology, biology, human science and philosophy. 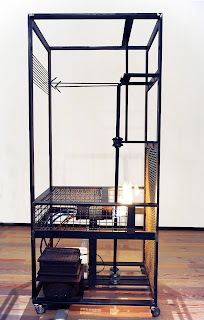 All of the “models” are constructed as fold-out upright rectangular boxes measuring 210 x 80 x 60 cm or 210 x 140 x 60 cm. Through their volume they add a fourth dimension (time) to the space in which they stand. This unique group of works is completed by a series of preliminary drawings and sketches that allow us to trace in detail Wiedmer’s identification and development of solutions as an artistic process in time and another nine works on the ZeitZeichen done in mixed media ten years later, in 2007. 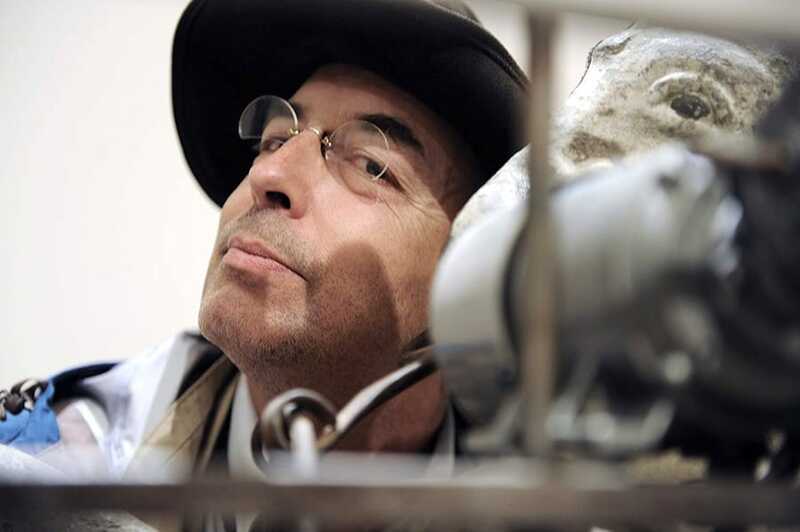 All of these works are powerful expressions of the Swiss iron sculptor’s creativity. Since the 14th century numerous artists have been fascinated by the topic of mechanical timepieces and the measurement of time. Yet, from the first extant late medieval works that deal with this topic, the treatment of time has been limited to showing timepieces as objects. This iconographic tradition of depicting time is not the preserve of pre-modern representation, but continues into the 20th century in the works of artists such as Paul Klee and Salvador Dali, who use clocks as objects to express the human experience of “melting time”, as in Dali’s famous painting. As discussed above, this motivic level of pictorial works is not the starting point for Wiedmer’s ZeitZeichen. Rather, they are present as “signs about time” and, hence, in time and as the “eternal now”. 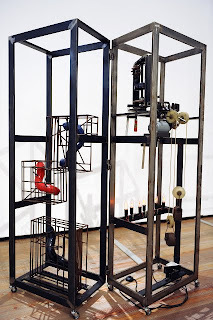 In ZeitZeichen each of the moveable “boxes”, which are equipped with wheels and thus mobile in space – in the time dimension – the aforementioned elementary principles or factors behind the development of the mechanical clock are actually set in motion by means of wheelworks and pendulums – and thus translated into a time sequence. 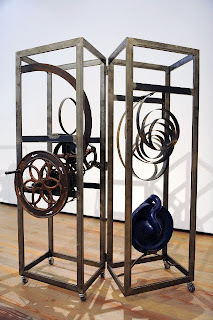 These “Sculpt- Clocks” with their springs, balance, spirals, and similar components represent both technologically rooted cultural innovations and artistic innovations of the past few centuries; they are an expression of the genuine melding of art, timepiece and culture. How long does it take for vine blossom to become a mature grape in the Portuguese Douro? 100 days! That’s also the length of the honeymoon period US presidents traditionally enjoy when they enter office.